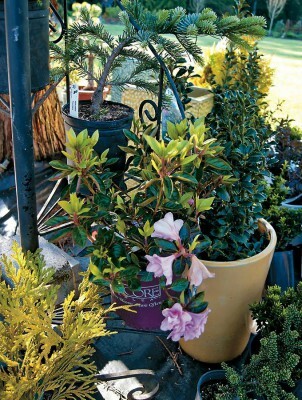 When it comes to plants, Heidi Kaster just can’t say no. 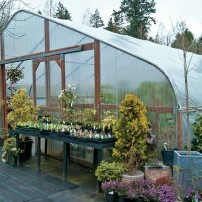 Even though her Dragonfly Farms Nursery and attendant display gardens are full to bursting, she continues to bring in truckloads of cool new plants, old tried-and-trues and leafy-green deals throughout the growing season. Along the Dragonfly aisles, dark-leaved dahlias wink and wave, blue — or gold-leafed conifers shake their manes in the breeze, and dainty bloodroot blossoms pop from their pots like spring parasols. 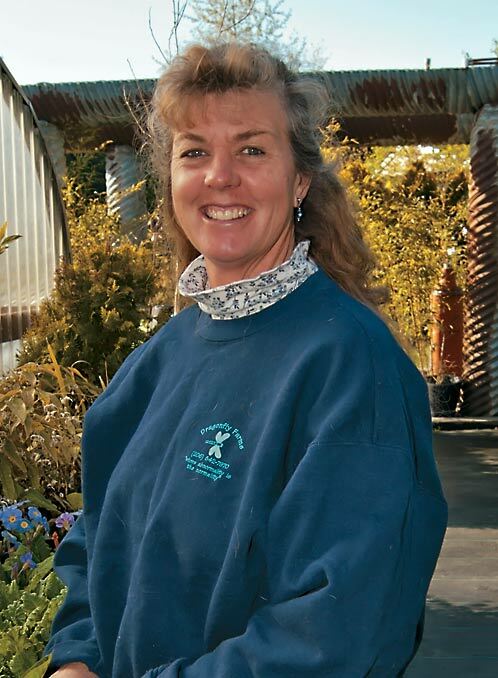 In every season, in every corner of the nursery, the variety and quality of the plants prove not only Kaster’s lack of willpower, but her enthusiasm for all things that bloom and grow. This happy mingling of obsession and energy are as much a part of the Dragonfly magic as the inventory. 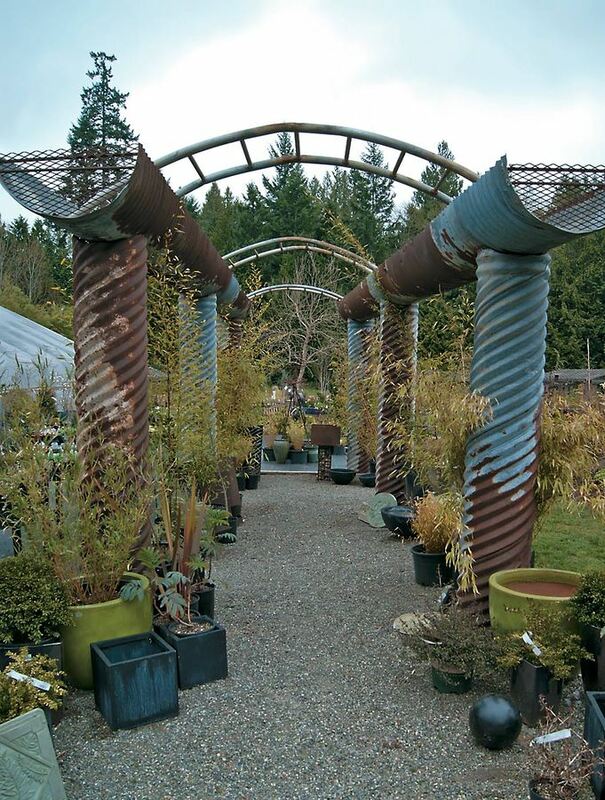 A trip to the nursery, located between Kingston and Hansville, feels more like dropping in on friends than merely running out to pick up plants. 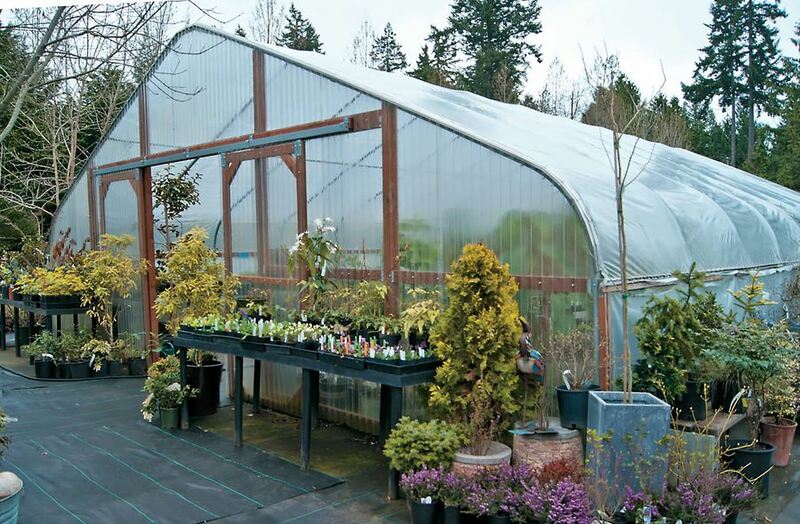 Kaster and her nursery staff, Tory Galloway, Susan Doyle and Dave Dewire, are all gifted at giving customers their full attention: making suggestions, swapping stories or exchanging opinions about the greater Puget Sound gardening community. Throw in a stroll around the enormous gardens and a sandwich at the nursery’s on-site coffee shop, and Dragonfly is a full-service stop for food, fun and flora. 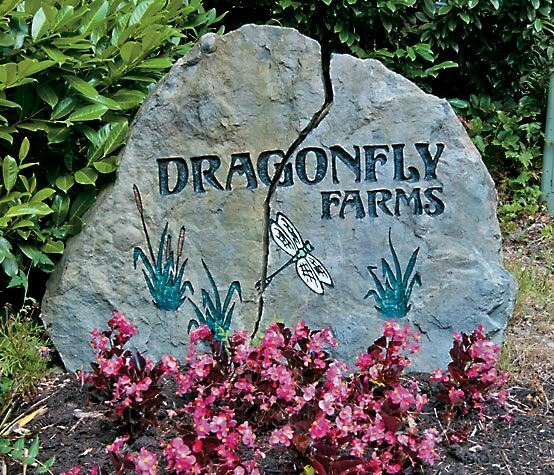 In business at the current site for 13 years, Dragonfly Farms helped meet hobbyists’ hankerings for unusual and hard-to-find plants when its world-renowned neighbor, Heronswood Nursery, closed in 2006. Kaster acquired a trove of Heronswood stock, the offspring of which may still be found at Dragonfly, along with thousands of other garden treasures. Although certain offerings at the nursery may be esoteric, Kaster and crew are as happy advising customers who have little or no knowledge of Northwest gardening as they are discussing the relative merits of Grevillea australis vs. Grevillea victoriae with confirmed plant nerds. “And we’re happy to redirect customers to plants that are better for their particular situation,” adds Galloway, a former nursery owner with a specialty in drought-tolerant plants. Galloway also has a soft spot for “no-brainer” plants: ones that give more than they demand. Some of these, including shrubby Osmanthus burkwoodii and Northwest-hardy leptospermums, make attractive, low-maintenance evergreen backgrounds that are good for screening neighbors and setting off showier foreground plants. Galloway calls these stalwarts the “little black dresses” of the garden. Of course, the point of such unpretention is accessorization, and Dragonfly is happy to help there, too, with pretty floral gems, bold variegates and assorted exotic taxa. To inspire customers even more, the staff recently reorganized the entire sales area, leaving more room between tables and clustering compatible plants into islands of horticultural wonder: like store mannequins that show off the possibilities of mixing and matching the merchandise. The new, consumer-seducing staging presents mini-vistas of color and design that, together with Kaster’s extensive on-site gardens, guarantee to set the most sluggish creative juices flowing. 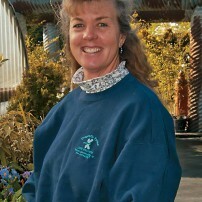 In 2013, Kaster continues her popular special events and specialty nursery program. 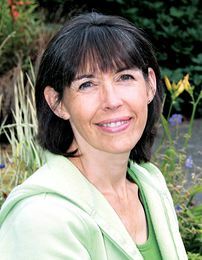 This summer she hosts Deserts Northwest, selling its drought-tolerant plants on July 20-21. 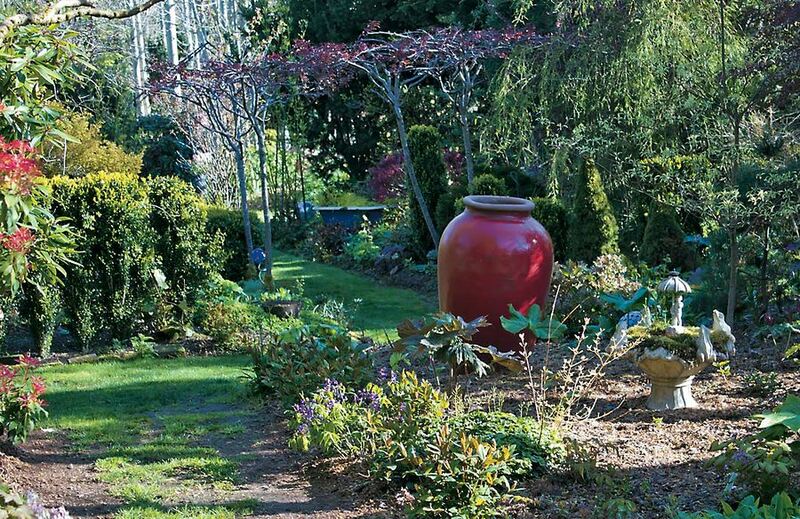 The Hansville Ladies Aid Garden Tour includes Dragonfly on July 27. 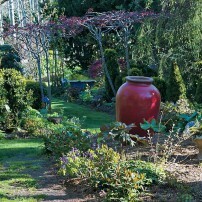 July 27-28 is the nursery’s annual Garden Art Festival. On the second weekend of every month, Dragonfly will host pruning classes taught by team member and Wabi Sabi Bonsai owner Dave Dewire. Inspired by Dewire’s expertise, Kaster has stocked up on rare conifers. This unique inventory, coupled with Dewire’s grafting skills, has attracted the attention of the American Conifer Society, which has planned a tour of the nursery for September. The Garden Art Festival is a natural extension of Dragonfly’s practice of filling the nursery with locally crafted outdoor art. Every day, the work of six artists peeks from beds and borders to tempt shoppers. Potting benches and petal-bright lawn chairs are composed of pallets and other reclaimed woods. Funny fry pan faces and tin men are the work of Dennis Kommer, of Rusty Soul Creations, who finds the raw materials for his pieces at his other business, North Kitsap Metal Recycling. Artist Ray Hammar, of Blue Collar Art, also uses recycled materials in his metal vegetable boxes and other functional sculptures. When it comes to repurposing, however, no one does it like Kaster. This year she added to the nursery a satellite dish given to her by a landscape client. Set flat with the curved side up, the huge metal structure is being planted into something resembling the Jolly Green Giant’s cereal bowl. Obviously, Dragonfly’s motto, “Where abnormality is the normality,” does not apply only to plants. Kaster likes to mix it up in the gardens, too. This year she experiments with annuals — mainly old-fashioned ones such as amaranth (love-lies-bleeding), nigella (love-in-a-mist) and Persicaria orientale (kiss-me-over-the-garden-gate). Starting these old favorites from seed is child’s play for a woman who grows much more challenging perennials from seed each year in her greenhouse. 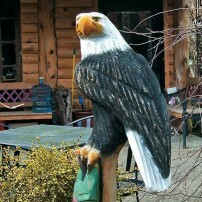 Aaron Waag was a man who loved eagles and — like eagles — he spent much of his time in trees. A professional tree climber, Waag lost his life on the job in 2011. In his memory, Dragonfly Farms built an on-site coffee shop that opened in 2012. Staffed by his wife, Ashley, the Dragonfly Pond Café serves espresso drinks, sandwiches and sweets. It offers indoor and outdoor seating. The building itself is made of recycled materials. 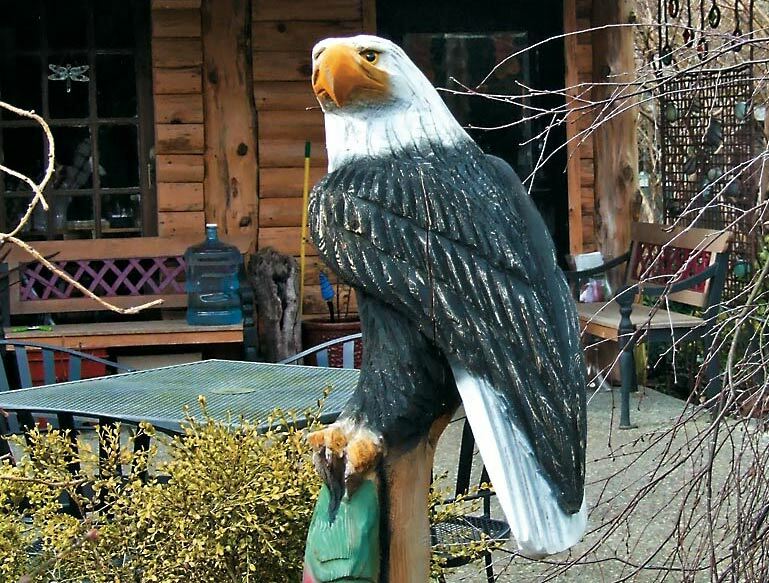 A carved eagle at the entry commemorates Dragonfly’s late friend and neighbor.The common names of the annuals on her list give a clue as to the inspiration for the plantings: They will provide cut flowers for friends’ wedding celebrations. Thursday through Sunday, March through October, Kaster and her crew of professional and volunteer plantspersons — as well as a mob of Australian cattle dogs — can be found roaming the nursery, welcoming visitors and spreading sunshine. 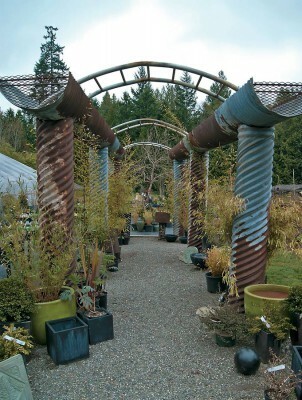 Dragonfly has become a go-to destination for ideas, advice, unusual garden art and reliable (if unusual) plants. While Kaster may not be able to say no to plants, she knows how to narrow down the choices for her customers. 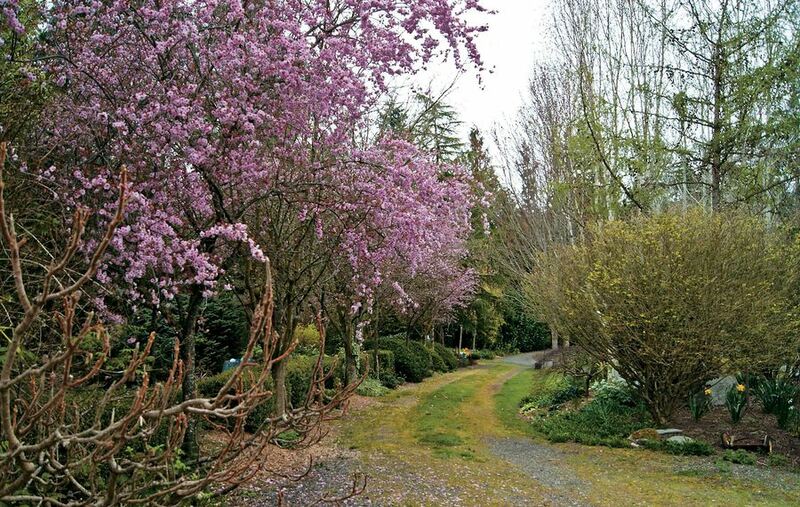 The second weekend of every month there will be a tree pruning class with Dave Dewire. 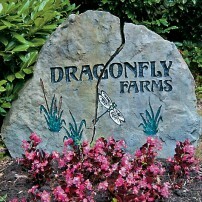 Visit www.dragonflyfarmsnursery.com for more information. Sign up for the e-newsletter and receive a special discount, followed by monthly newsletters throughout the growing season that feature new plants, additional discounts and information on events and sales.